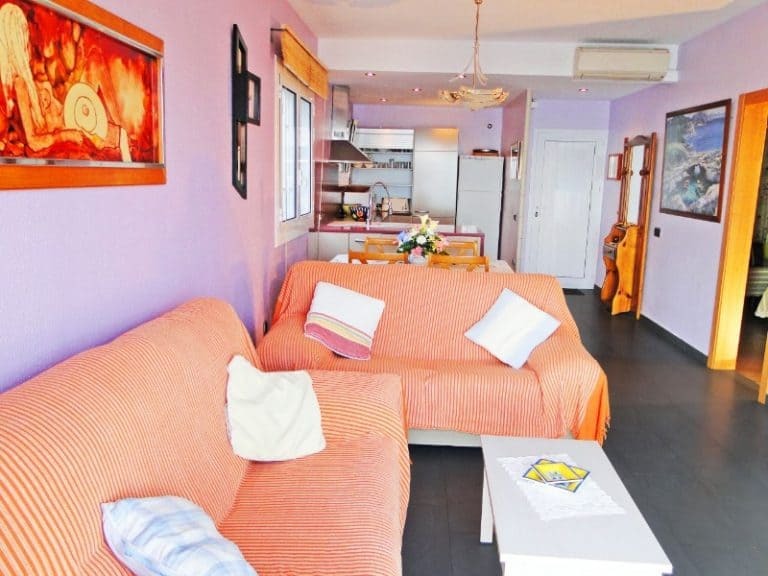 Cau del Llop 1 is a very comfortable, fully-equipped modern apartment that is located in a very quiet residential area, 300 meters away from the family beach “Cau del Llop”. Enjoy a wide 180-degree inspiring view over the sea, stretching from Cap de Creus to Cap de Cerbère, including the possibility to watch the spectacular sunrise over the sea. 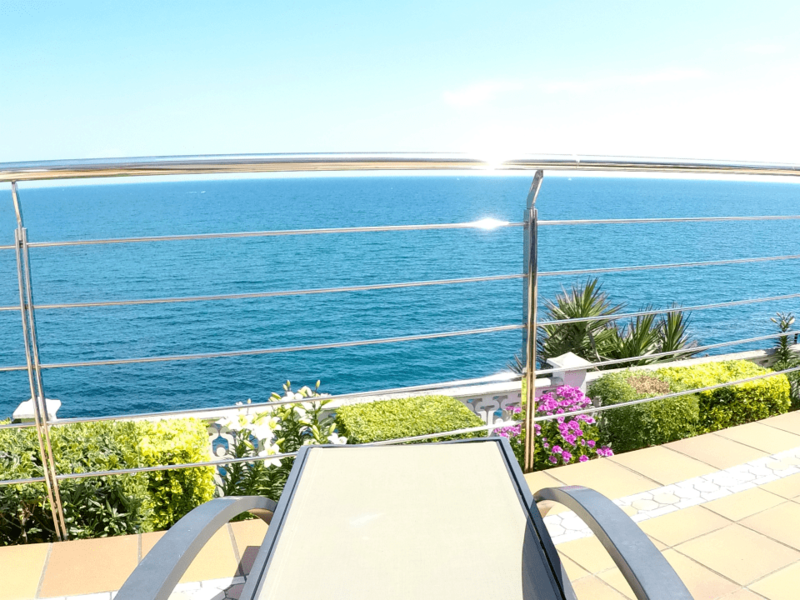 Just in front of the Sea, you could literally fish from the terrace. 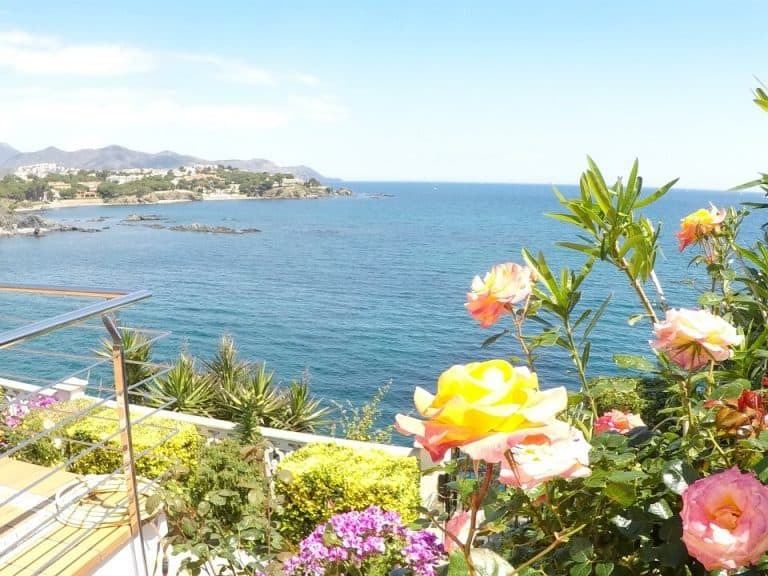 Direct access from the terrace to the beautiful coastal walking path “Camí de Ronda” that extends several kilometres on both directions. You will love the blossoming garden and the splendid two-level terrace! It feels like being in a cruise ship floating over the sea. Use the barbecue to delight your family with a delicious terrace dinner that stays in their memories. Apartment Cau del Llop 1 is on the ground floor, directly in front of the sea, in a building with just 5 apartments, of which only 2 are direct neighbours, one on top and one on the side. A private parking place for one car is located just in front of the building. A 65 square meter living area with capacity for maximum 5 people, but best suited for 4 to be fully comfortable. Main bedroom with queen size bed, full wardrobe and access to the terrace. Second bedroom with two single beds and a wardrobe. Comfortable mattresses to have a good rest. There is a fifth bed, which is a folding bed. Full bathroom with shower cabin. Large piece combining living room and kitchen, with panoramic sliding windows. You can watch the Sea from any angle. Feel at home finding everything you need. Very comfortable living room with two sofas, TV with Pal/Secam and satellite dish. Dining area with table and chairs. Tastefully designed, fully-equipped kitchen with oven, fridge-freezer, microwave and dishwasher. Very scenic views of the sea from almost any angle. There is in an exterior lockable storage room where you will find cleaning materials, an iron and a washing machine. Private 80 square meter garden with plenty of flowers that blossom at different times of the year. A two-level magnificent terrace with garden furniture: tables, chairs, sunbeds and sunshade. In the private garden, there is also a stone barbecue. And a nice fresh corner with shading, a table and a stone bench to sit, perfect for a very hot day. 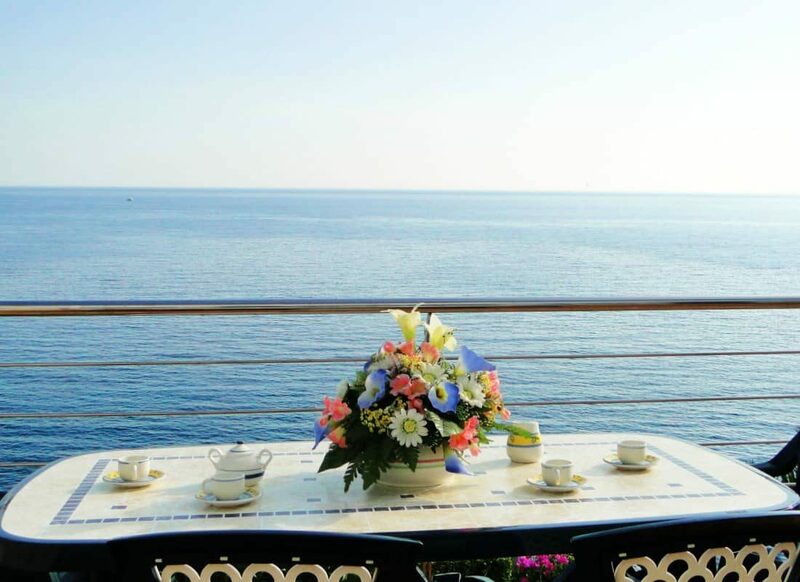 The terrace… sitting in the evening in front of the dark Sea, watching the fishing boats prepare the lights to attract calamari, sipping a glass of wine, enjoying the pleasant silence of the sea, rhythmically broken by the waves against the rocks. We are confident you will love staying in this apartment. Watch the sunrise from terrace, getting ready for breakfast. Or watch it directly from bed in the main bedroom, next to your couple… Can it get more romantic? Hemos pasado 15 dias maravillosos en este apartamento. Lo conocimos hace seis años y desde entonces estamos viniendo por aquí. El apartamento? Maravilloso! Tiene todo lo imprescindible y necesario para estar comodamente, incluido lavavajillas y wifi. 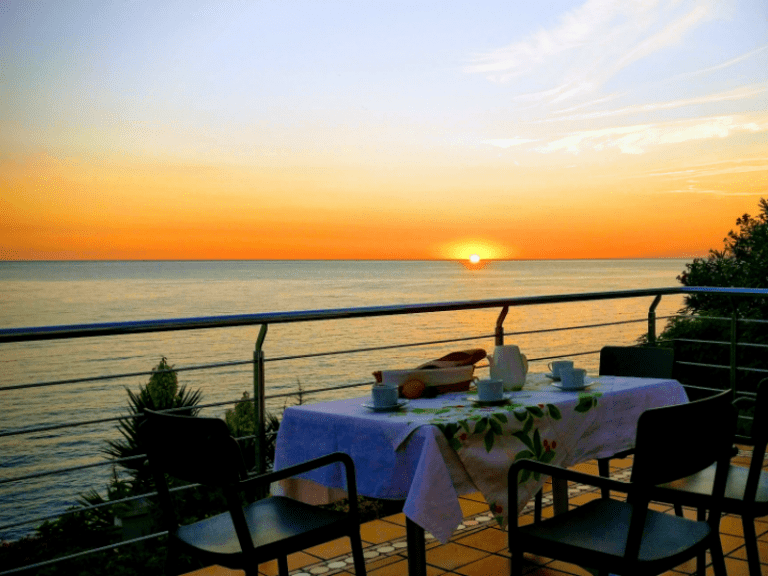 Y como valor añadido una terraza maravillosa, que es lo que más valoramos nosotros, y de lo que más disfrutamos. Location conforme à la description, idéalement située, une vue de la mer agréable , qui se trouve à 200 m, la voiture peut rester sur le parking durant tout le séjour, car tout se trouve à proximité, le joli port de Llanca, les bons restaurants, les plages, le chemin de la ronde pour les balades ou les footings pour les sportifs, courir tout le long du chemin de la ronde jusqu’à puerto de la Selva puis revenir à Llança, parcours magnifique avec la mer à côté pendant 14 km. Accueil très chaleureux des propriétaires. De très bons conseils de visites nous ont été donné. Nous y reviendrons forcément, très gros coup de coeur pour cet endroit magnifique.et cet appartement bien exposé et décoré avec goût. A very special place, where one can enjoy daily the ever-changing wide view of the sea and contemplate the colourful sunrise on the horizon, where the sea meets the blue sky. It is a strategic point of the Catalan coast, where mountain and sea combine as the Pyrenees take a dive in the Mediterranean Sea. Be ready for a unique landscape full of natural surroundings. A great place to practice any sport: swimming, snorkelling, scuba diving, fishing, sailing, windsurfing, kayaking, hiking, cycling, running, taking a scenic walk, or just relaxing in the beach. (3) It is very familiar, with its beach refreshment stall with food and ice creams. Since it is a bit distant from the town and it is not easy to find a parking place on high season, it is very familiar, mostly only enjoyed by the neighbours so it never gets crowded, meaning you can always find a great spot to enjoy it. Actually, there are over 30 beaches in the vicinity of Llançà, so you can explore a different one every day. Visit the Explore Costa Brava section for more information. We regularly take a walk along “Camí de Ronda” till the next town, Port de la Selva, just 6 kilometres away, and we never get tired of it. Along the way, you can find a large amount of beaches, coves and different accesses from the rocky formations to the sea. It is frankly an ideal place to spend your holidays if you are looking for calmness, inspiring views, a nice environment to practice any sport and comfort. By plane: The closest Airports are Girona – Costa Brava (GRO) and Barcelona – El Prat (BCN). There is a good offer on rental cars on both airports. We recommend a car if you want to move around the area. By Train: There is a Train Station in Llançà. Line R11 from Barcelona to Portbou. It is a 30 minutes walk from the station to the apartment. (1) From the A-7 motorway, take exit number 3 (if you come from France) or exit number 4 (if you come from Barcelona or Girona) and follow the directions towards Llançà, following road N-260. (2) Once you take the exit to Llançà you will see a “Repsol” petrol station. Follow the road and after a sharp left curve, you will find a roundabout. Continue straight direction “Port the la Selva”. (3) After 1500 meters you will find an indication to “Platja Cau del Llop”, which you should not take. Continue on the road instead and turn left after the third curve, indicated “Platja Cau del Llop – C/ Cadaques”. At the end of the street turn right, and after 100 meters you will find the apartment on the left side. The private parking space is on the right, next to a low white wall. Reservations are for full weeks and arrivals and departures are always on Saturdays. Arrivals are from 16h to 20h. We can adapt these times depending on each situation, but It is always necessary that we agree an estimated time of arrival. We have installed a WiFi private network for our guests. If you are interested in using the WiFi, the price is just 15€ a week. We offer, in case you would prefer not to bring it yourselves, a rental of bed linen and towels. The price is 15€ per person. One set includes bed linen and a bath towel per person, plus and a hand towels and kitchen rags. The price includes 80kWh/week of electricity usage, which is the normal consumption of an average family. Because we had cases in the past where our guests made an irresponsible use of air condition (such as leaving it on during the whole day with open windows) we started asking for a deposit of 20€/week at the beginning of the stay. At the end of the stay we read the consumption, and in case the 80kWh/week which are included are exceeded, we charge the difference at a rate of 0.39€/kWh. You can decide whether you would like to use the air conditioner or not at the moment you enter the apartment. If you have any questions regarding the area, the property or availabilities please drop us a line. We are here to help!